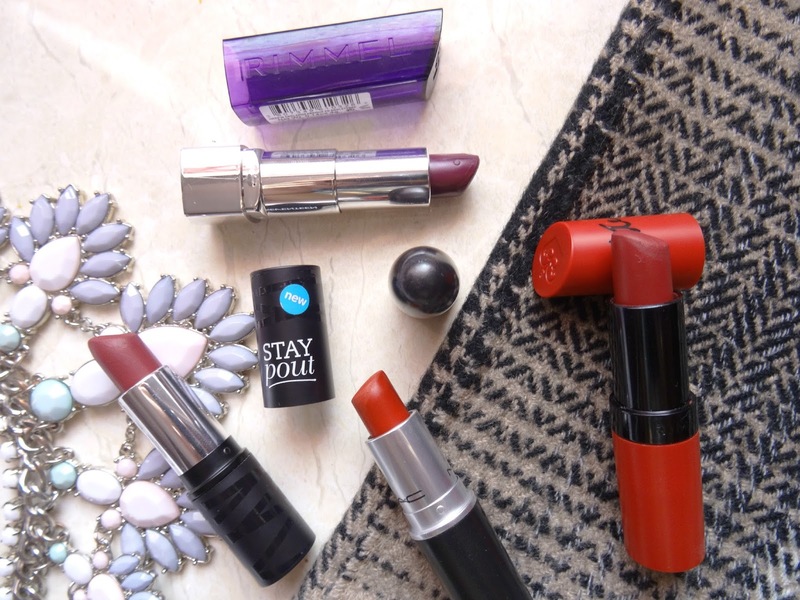 It's officially Autumn which means we can pull out the dark lipsticks hiding at the back of our drawers and put away the corals and bright pinks! I don't wear lipsticks that much but I always start off Autumn with dark bold lips, so I thought I'd share with you my top 4 choices. A little tip: if you suffer from dry lips during the colder months, then lightly brush over your lips with a toothbrush and apply an intensely moisturising lip balm like Carmex or simple Vaseline just before you go to sleep and you'll wake up the next morning with soft, smooth lips ready for your bold lipsticks. If you had told me 2 years ago that I would love dark purple lipsticks, I would have never believed you, but the Pinterest and Instagram girls have made me fall in love with dark -purple lipsticks! I think they look so effective with simple makeup. This one from Rimmel is quite dark and sometimes I feel like it's too dark for me to pull off, so I pat on a small amount and then rub it into my lips, dabbing with a tissue every now and then to get it to stay in place throughout the day. I feel most comfortable when I apply the lipstick in this way. I also find that this lipstick can be a bit too moisturising and so if you don't pat it down it can look quite patchy. The actual colour is a nice vampy red/purple and makes your teeth look pearly white! If you hate lipsticks that have an odd smell, then this one isn't for you. It took me a while to get used to that 'old-grandma-lipstick' smell, but the colour of this lipstick is too pretty not to wear. It's a blood-wine red and applies really well. It does get a bit patchy after a while so you do have to keep an eye out on it. The colour weirdly makes my lips look quite small so I tend to apply it with a darker lip liner first. As many of you probably know, MAC matte lipsticks can be really drying and I do have to agree. But with a bit of lip balm prior to application, you're usually good to go. This is quite a bright red compared to the other lipsticks and it reminds me a lot of the festive season. I kind of forgot about this lipstick until I wore it on a night out and fell back in love with it. In pictures it can sometimes look like a pink lipstick (like my current profile picture). I think I'll get a lot of wear out of this lipstick this winter!! How could I do this post without mentioning the blogger's favourite, 107! This colour is actually very similar to Rule Breaker, but in terms of texture, I prefer this one. It's much more creamy and applies more evenly. 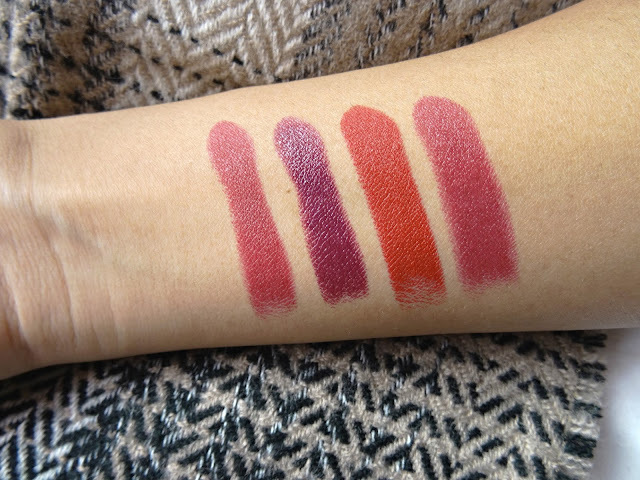 It's a semi matte finish without having any drying qualities - so really is a go-to lipstick! I love the vampy/wine colour and I think it would suit every skin tone. It also acts as a perfect stain so it's great for nights out where you don't want to be thinking about reapplying your makeup. 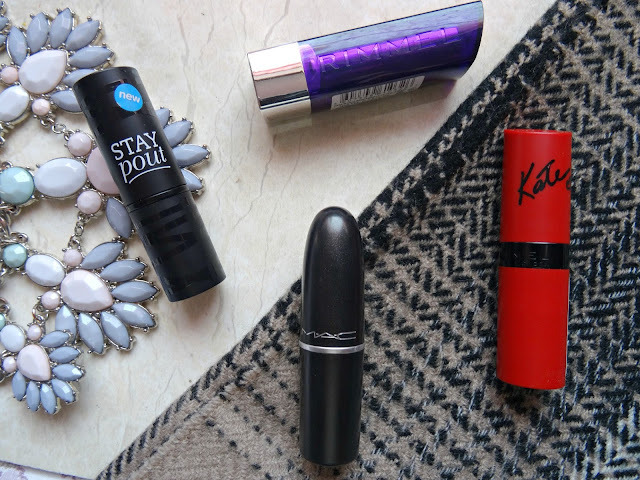 I hope you enjoyed reading about my top 4 dark lipsticks, I would love to know what your favourite dark lipstick is! I absolutely love Rimmel 107 too :) I don't own Russian Red but I do have Diva and I have been using it non-stop these A/W months! 107 is a classic! Oo I've not tried Diva, I'll need to check that one out! New In At New Look for AW15 - All Under £30! The £3 highlighter that beats all..